This course deals with the art and architecture of the Middle Ages in Western Europe from the time of Charlemagne until the Late Gothic era. With the spread of indigenous Germanic traditions, Roman culture gradually died out. Even when Charlemagne’s effort to resuscitate the Roman Empire brought about some awareness of classical culture this was only a fragmentary recollection. Any occurrence of classical forms was but an isolated survival of a bygone age. Charlemagne’s renovatio established an ordered society but also ushered in a new age of faith. 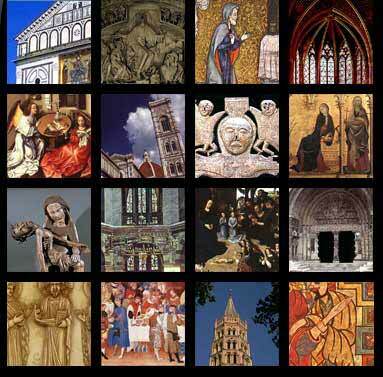 Churches and monasteries that proliferated on the map of Carolingian and Romanesque Europe became new centers of learning and art. Monastic intellectual and cultural activity gradually waned with the economy shifting from the countryside to the growing cities. A new cultural milieu displaying unprecedented responsiveness to the material world developed in urban centers. Evolving in a variety of local idioms the realism of Gothic imagery stands in strong contrast to the highly stylized and sometimes almost abstract forms of the Romanesque. Similarly, the bright interiors of the soaring cathedrals that dominated the skylines of medieval cities present a strong contrast to the massive and dark structures of the preceding era. Profusely strewn with extensive sculpted programs, symbolic and narrative in content, and detailed with elaborate ornamental stonework, they stand in antithesis to the strict and austere lines of the classical tradition. Impressive not only in size and abundance of decoration, but in elegance of form and proportion, these architectural masterpieces remain as the most impressive symbols of this age of faith. For further information on the course see the Syllabus, Requirements and Readings.